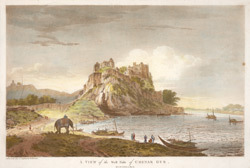 This is plate 3 from William Hodges' book, 'Select Views in India'. Chunar was once a strategically important town, particularly when it was under Mughal control. The fort, on a rocky promontory on the Ganges, served as a Mughal garrison for almost two centuries and passed in 1750 into the hands of the Nawabs of Oudh. The British took control of it in 1764 after the Battle of Buxar. William Hodges and his patron, the Governor General of India Warren Hastings, sought refuge in Chunargarh on the night of 21 August 1781, wheb Raja Chait Singh began his rebellion against British rule.